Tune up your PC's security with a few clicks. 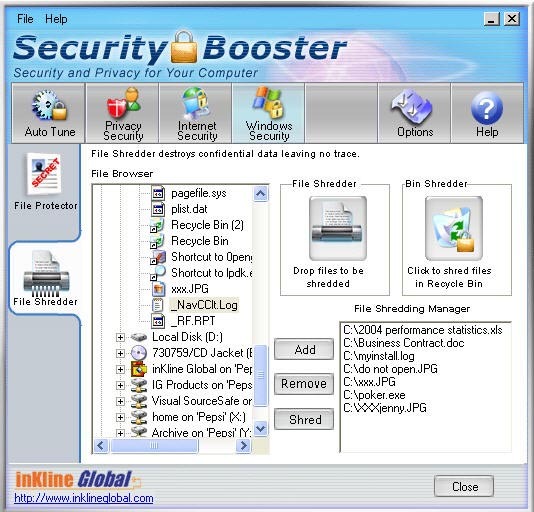 Security Booster helps to auto-protect your PC against potential harmful attacks from malicious scripts, Trojans and hijacking. Prevent sensitive data like passwords from being exposed to hackers. Secure your sensitive files against unauthorized intrusion with military grade encryption. Get peace of mind while online! Easy for PC novices and power users alike, no PC security knowledge required. ...... suspicious connections. The Malicious Script Watcher detects potentially dangerous scripts that allow potentially dangerous elements to infiltrate your system, then lets you chose whether to let these scripts through or not. Guard sensitive documents with File Protector by securing your files with military grade encryption. Do you have files that you want to be thoroughly destroyed and do not want other people to retrieve? Using Secure Shred TechnologyTm, File Shredder can remove your files permanently, ensuring that your unwanted files can never be recovered from your system again. Clean up traces of your surfing by erasing your history logs, Internet cookies and temporary Internet file easily. You can avoid potential Internet frauds and hackers tapping on your financial and other sensitive information such as passwords, log-in details and financial information by securing all these data from prying eyes. Get peace of mind by tuning up now. A cost-effective and all-in-one system security solution. Highly improves your computer's security. Qweas is providing links to Security Booster 3.0 as a courtesy, and makes no representations regarding Security Booster or any other applications or any information related thereto. Any questions, complaints or claims regarding this application Security Booster 3.0 must be directed to the appropriate software vendor. You may click the publisher link of Security Booster on the top of this page to get more details about the vendor.